Nobody likes to be the bearer of bad news, but a look at the Office for Budget Responsibility’s (OBR) projections shows that the recovery is, at best, on shaky ground. Why? Well, simply put, it is based on debt. You, I and all our neighbours and friends should max out our credit cards (those among us who haven’t already done so, that is) in order to keep the economy going. 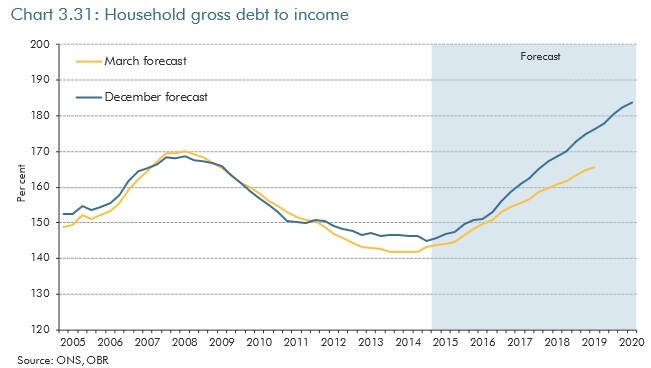 The chart below shows the OBR expects household debt to increase from around 145% of income this year to 151% by the end of next year and to more than 180% by the end of 2020. The December projection for household debt has been sharply increased compared to the one made in March. Private consumption will continue to do all the heavy lifting when it comes to the economic recovery, Liz Martins and Karen Ward, economists with HSBC, wrote in a recent report about the chancellor’s Autumn Statement. This year, according to the OBR, private consumption will contribute 1.5 percentage points of total economic growth. This will increase to 1.8 percentage points next year; it will fall to a more modest 1.4 percentage points in 2016 to climb again to 1.6 ppts in 2017.
Business investment contributes only 0.8 ppts this year, 0.9 ppts next year, 0.7 ppts in 2016 and 0.7 ppts in 2017. However, it is not clear what will drive private consumption forward. The two HSBC economists note that, for the Bank of England, it’s a combination of a still falling savings rate and rising wage growth, while for the OBR it’s higher consumer borrowing combined with lower savings. 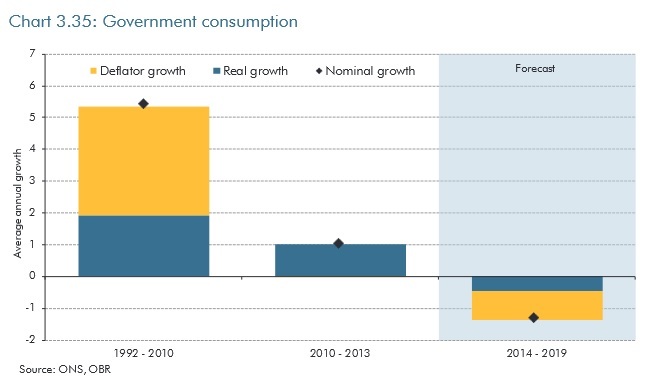 Until last year, the pace of government consumption growth has been slowing, but it was still growing. Going forward, it will actually decrease – at a pace that many analysts have said will be impossible to sustain. The plans imply that government spending as a share of GDP will fall by 5.0 percentage points between 2014 and 2019-2020, to its lowest level since 1972-1973, Simon Ward, chief economist at Henderson Global Investors, said. As unrealistic as these plans may be, if we take a look at revenues it becomes pretty clear why the government wants to cut spending so drastically. The OBR said the tax-to-GDP ratio is expected to fall by 0.5 percentage points between 2013 and 2014 and 2014 and 2015. “This is despite real and nominal GDP growth picking up strongly,” the OBR acknowledges. It expects the ratio to recover over the next two years but then to remain flat until 2020. Bear in mind that these things happen with the economy in full recovery mode, interest rates at record lows and an environment of benign inflation. However, if inflation and interest rates increase, the picture could change radically for the worse. Oil is another unknown quantity; with the international Brent price crashing, tax revenues from North Sea oil could fall rapidly, creating more headaches for the government. Yet another factor that could bring uncertainty, although for the medium term rather than the short term, will be the devolution of some tax raising powers to the regions, and the further loss of revenue to that budget that it would bring. So yes, enjoy the cut in Stamp Duty and the higher personal allowance. But the way things are going, these populist measures might need to be offset by much deeper cuts elsewhere, and those are likely to be really painful.